Leachability of lanthanides from the radioactive pegmatite pockets found in Gabal Abu Furad area, southwest Safaga city, limited by latitudes 26°37′ and 26°43′ and longitudes 33°36′ and 33°43′ E. Central Eastern Desert, Egypt. It was investigated using different acids at different concentrations, liquid-to-solid ratios, contact times and temperatures in order to determine the optimum recovery conditions. The best leaching efficiency was obtained with 40 g/l HCl solution, 8 hours contact time, 90°C temperature and 1:5 (g/ml) solid:liquid ratio. Afterwards, lanthanide stock solutions were prepared by applying the optimum leaching conditions. Lanthanides were then precipitated by either 10% oxalic acid or 20% sodium hydroxide solutions. Electron scanning microscope (ESM) analysis was utilized to determine the qualitative percentage of the existed lanthanides. It was found that thorium percentage was around 10.05%. High percentages of light lanthanides were detected, e.g., La (11.16%), cerium (39.97%), Pr (6.21%), Nd (13.99%), Sm (2.00%), and Gd (1.06%). Gabal Abu Furad area is located 40 km south west of Safaga city on the Red Sea coast and is bounded by latitudes 26°37′ and 26°43′ and longitudes 33°36′ and 33°43′ E. It is covered by metavolcanics, amphibolites, metagabbros, older and younger graintoids. These lithologic units are dissected by dykes of different composition as well as pegmatitic bodies (Figure 1). Pegmatites occur as pockets and vein-like bodies and show wide variation in both length and thickness. 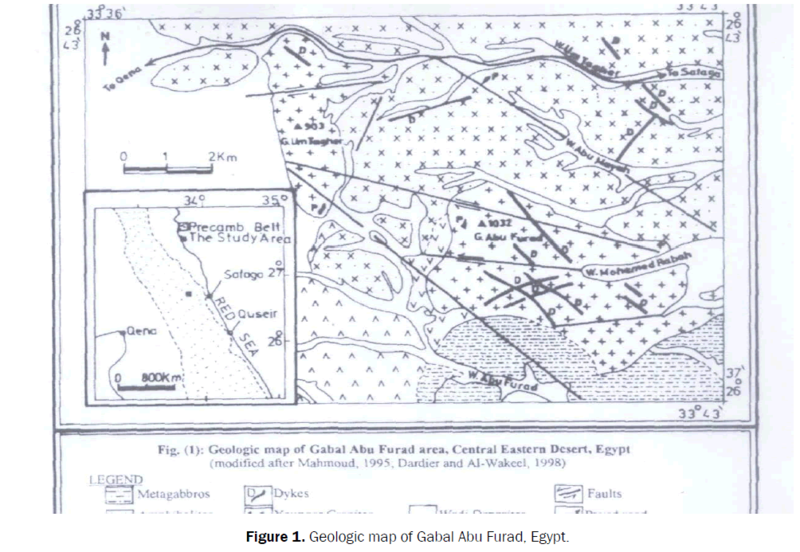 Figure 1: Geologic map of Gabal Abu Furad, Egypt. Lanthanides are a unique group of metals regarded as being among the most critical elements that are highly valued for their specialized applications in many modern technologies. In recent years, lanthanides are a significant topic of interest in the industrial metals due to a global supply shortage and strengthening demand [1,2]. This has led many companies to develop processing techniques for extracting lanthanides from less common lanthanides bearing deposits  and reclaiming lanthanides from end-of-life products by recycling (urban mining) spent batteries, phosphors and permanent magnets [4,5]. One such example is the apatite group of minerals (mainly fluorapatite) which are commonly mined for the production of phosphoric acid in the fertilizer industry . Lanthanide elements as well as scandium and yttrium, play a critical role on the global economy due to numerous applications for those elements. Lanthanides-based materials are used in magnetic refrigeration, electronic industry, steel industry, household batteries, fluorescent lamps, permanent magnets, lasers for surgical purpose and nuclear technologies [7,8]. The global consumption of lanthanides exceeds 100,000 t in 2011 and is expected to be doubled by 2020 with an annual growth rate from 4 to 9% . Among the lanthanide elements, some are more critical for industrial applications and their supply might be threatened in the next decades. In particular, Nd, Eu, Tb, Dy and Y are expected to become highly strategic metals in the future [9,10]. For instance, the global demand for Nd and Dy is projected to grow by 700% and 2600% in the next 25 years . *Intensive effort* being made worldwide to recycle lanthanides from waste electronic equipments, magnets or waste fluorescent lamps [11-13], yet the lanthanides are still mainly recovered from natural minerals like monazite [(Ce, La, Y)PO4], xenotime (YPO4) and bastnasite [(La, Ce)CO3F]. Recovering lanthanides is a complex process which involves mining the ores bearing lanthanides minerals like Monazite and Bastnaesite, followed by mineral dressing, chemical upgrading and refining procedures . It is important that the ultimate refining procedures actually bring about maximum possible recovery of the lanthanides present in the ore, while optimizing the costs involved in all the operations. Physical beneficiation techniques alone such as froth flotation, magnetic separation, gravity separation etc. are not optimal methods for obtaining a market grade concentrate . These techniques need to be followed up by processes such as leaching and solvent extraction, which have subsequently shown a higher percentage recovery of lanthanides from the pretreated ore . Leaching is a widely used extractive metallurgical technique for the extraction of the metal of interest from its ore or concentrate in the presence of a solvent known as the leaching agent. Generally, strong acids were employed for the greatest recovery of lanthanides , which dissolves the desired lanthanides present in the ore into the solution. These hydrometallurgical operations have got several advantages; they may start on a small scale and can expand on to a larger one, and these operations also allow greater control in processing ores for the recovery of valuable metals . The major advantage of the leaching process is that it selectively dissolves the metals inherent to the ore, leaving behind most of the impurities. This reduces the processing complications and hence makes the extraction step simpler. Though leaching is an efficacious technique of lanthanides extraction, it poses a few problems with respect to its usage. The process leaves behind metal depleted materials with residual chemicals, also known as ‘leach piles’, which are hazardous to the environment. In the absence of certain suitable measures, the leaching process may lead to contamination which might be harmful to life . During leaching, some of the undesirable components present in the ore can pass into the solution along with the desired lanthanides, complicating the subsequent extraction processes . The leaching operation involves large volumes of solvent requirement for comparatively small metal outputs, which consumes considerable amount of space and requires laborious handling of large amounts of solvents . Monazite, bastnasite and xenotime are considered the most important sources of lanthanides . According to the previous mineralogical studies  and chemical analysis El Galy  revealed the presence of high content of lanthanides. Kamal  studied uranium leaching and extraction processes from Abu Furad radioactive pegmatite and concluded that about 97% of uranium existed in the studied sample was leached under the following optimum conditions; 60 g/L sulfuric acid concentration, 6 hours contact time, at room temperature (25°C), -60 mesh size and 1/5 solid/liquid ratio. Extraction of uranium was achieved using ion exchange resin technique. Finally, direct precipitation of uranium was performed. Lanthanides recoded in the study sample was precipitated and identified by the ESM. This previous work makes it very important to perform a technological study on a high lanthanides concentration representative sample. The main objective of the present work is the precipitation of all the existed lanthanides through leaching study to give their highest leaching efficiency. Finally, the identification of the obtained end products (lanthanides oxalate or hydroxide). Essam and Ashraf  studied the fluid inclusion of the radioactive mineralized pegmatites at G. Abu Furad area and stated that the change in pH plays the main role in remobilization and precipitation of some rare metals such as U, Th, Nb, Zr, Y and REE in minerals assembly such as euxenite, zircon, carnotite, thorianite, allanite, bastnasite and fluorite. A technological sample representing Abu Furad radioactive pegmatite was chosen for this study as lanthanides bearing rocks. Abu Furad mineralized rock sample was firstly subjected to crushing and grinding followed by proper quartering. All chemicals and reagents used in this work are of analytical grade, sulfuric acid (97-99%), nitric acid (69%), hydrochloric acid (36%), oxalic acid (99%), formic acid (85%), ascorbic acid (99.8%), sodium hydroxide (98%), arsenazo III (99.8%), and distillated water. Sample was weighed using Shimadzu (AY 220) balance, a model HAANA pH-mV-temp., pH meter was employed for measuring pH values in aqueous phase. Environmental Scanning Electron Microscope (ESEM) model XL30. The visible spectra of metal complex of Ln and Arsenazo (III) were measured at 650 nm using a double beam spectrophotometer model Shimadzu 160A. ICP - OPE optical emission spectrometry used for measuring the concentration of individual lanthanides. Total lanthanides were determined by Arsenazo-III method. In a weakly acidic solution, the dye reagent is violet, whereas its complex with lanthanides the rare-earth elements is green. To the acidic sample solution (pH ≈ 1) 1 ml of 1% ascorbic acid solution was added. After few minutes, 1 ml of the format buffer and 2 ml of Arsenazo-III solution were added. The solution was diluted with distilled water to about 20 ml and the pH was adjusted at ≈ 2.6. The solution was transferred and diluted with distilled water in 25 ml standard flask. The absorbance was measured at 650 nm against reagent blank solution . The studied* factors affecting lanthanides leaching efficiency involved acid type, acid concentration, agitation time and leach acid to ore ratio as well as the slurry temperature. Proceeding to the second stage of this work, a stock solution of dissolved lanthanides was prepared by applying the previously concluded optimum conditions. These conditions were applied on 50 g of the sample and 250 ml of the studied radioactive pegmatite leach liquor was ready for the next step. This process was performed to produce a precipitate of lanthanides in the form either hydroxides or oxalates. 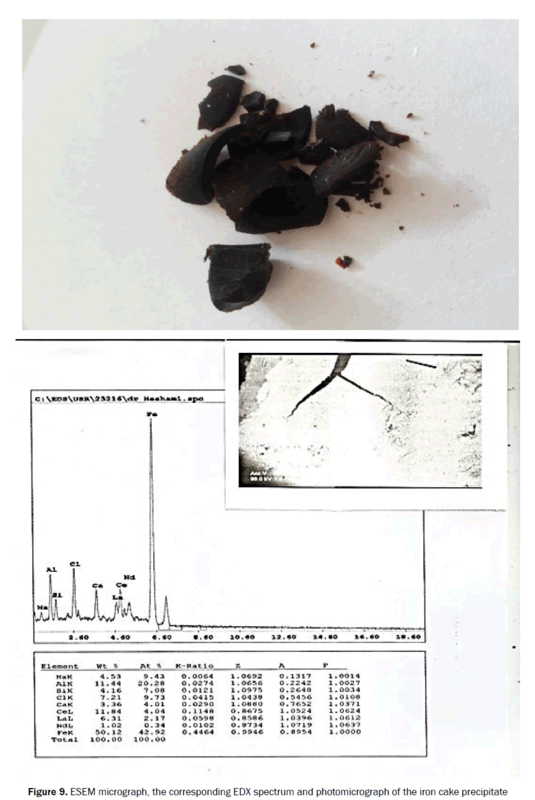 The obtained end product was investigated by ESEM analysis to confirm the existence of lanthanides and to some extent the purity of this product. Results of average major and trace chemical composition of Abu Furad mineralized sample published by El Galy  are given in Table 1. Table 1. Major oxides and trace elements analysis for the radioactive pegmatite . Lanthanides content of the studied sample was analyzed by the -ICP-OES optical emission spectrometry Table 2 revealing the presence of high content of some lanthanides. Table 2. ICP-OES analysis of the lanthanides content in the radioactive pegmatite studied sample. XRF analysis was performed Table 3 to identify the content of some of the most important elements besides uranium and lanthanides. Results of measuring total lanthanides content in the studied sample using U.V. spectroscopy instrument was about 23000 ppm, while uranium=2020 ppm and total iron=5.8 wt%. Table 3. XRF analysis of the study sample. According to the nature and mineralogy of Abu Furad mineralized studied sample, the acid agitation leaching technique was applied. A representative sample was prepared and subjected to this study under the following conditions: 40 g/l acid concentration, ½ (g /ml) solid: liquid ratio, -60 mesh size, at room temperature (± 30°C) and agitated for 4 hours. All mineral acids can dissolve the lanthanide elements under reasonable conditions with different efficiencies. The effect of acid type on the lanthanide dissolution efficiency from an ore material was studied using 40 g/l of H2SO2, HCl and HNO3 under the previously mentioned experimental conditions. The obtained results are graphically represented in Figure 2. Figure 2: Effect of acid type on lanthanides leaching efficiency from Abu Furad ore. Under the above conditions, the lanthanide elements leaching efficiencies were 35.7, 23.5 and 14.5% when using HCl, H2SO4 and HNO3 acids respectively. From the obtained results, it is clear that all the mineral acids can dissolve lanthanides from the studied ore material with different efficiencies, but HCl acid was the most effective one. Accordingly, the following leaching experiments were conducted using hydrochloric acid. Hydrochloric acid was studied as a leaching agent solution with concentrations varying from 20 g/l to 100 g/l where the other leaching conditions were kept: ½ S/L ratio, -60 mesh size, temperature 30°C and agitated for 4 hours. The obtained results are represented in Figure 3. Lanthanide elements leaching efficiencies were 7%, 35.7%, 36%, 36.5%, 37% with using HCl concentrations (20, 40, 60, 80 and 100 g/l) respectively. The leaching efficiency increases with the increase of acid concentration till it reaches a constant leaching percentage value. From the obtained results, the lanthanides are leached with different efficiencies, although 100 g/l of HCl acid concentration gave the best result 37% leaching efficiency, but 40 g/l HCl acid was chosen, for economic while by increasing acid concentration leaching of undesirable materials would be observed especially iron which has diverse effect on the purity of the final product. Figure 3: Effect of hydrochloric acid concentration on lanthanides leaching efficiency from Abu Furad ore. Contact time required for maximum leaching efficiency of lanthanides was studied in the interval from 2 hours to 10 hours under the following leaching conditions: - 60 mesh size, acid concentration 40 g/l with solid/liquid ratio 1:2 (g/ml) and ambient temperature (± 30°C). The obtained results are shown in Figure 4. 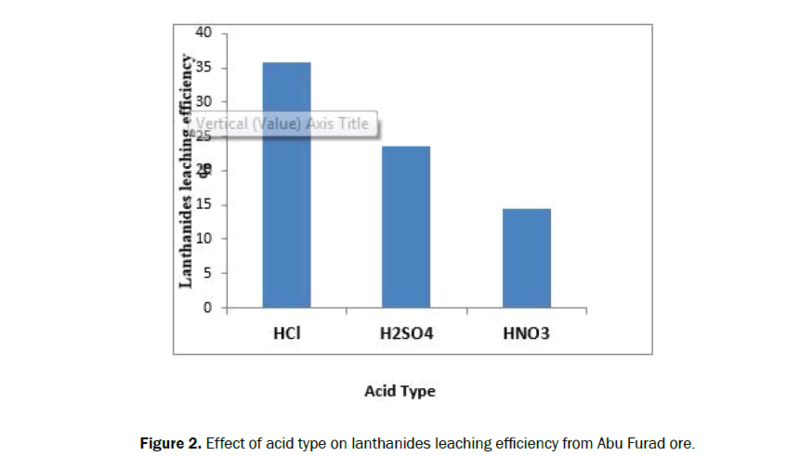 Figure 4: Effect of the agitation time on lanthanides leaching efficiency from Abu Furad ore.
From the experimental data it is clear that lanthanides leaching efficiency was increased from 2 % to 44.5% by increasing contact time to 10 hours. However, proceeding the leaching contact time to 10 hours was resulted in slight increase. Consequently, 8 hours contact time was chosen as the most effective one for lanthanides percentage leaching efficiency. Effect of temperature on lanthanides leaching efficiency from Abu Furad radioactive pegmatite was studied in the range from 30°C to 110°C under the following conditions: -60 mesh size, 40 g/l HCl, 8 hours contact time and solid:liquid ratio 1:2 (g/ml). The obtained results of leaching data are graphically presented in Figure 5. Figure 5: Effect of the temperature effect on leaching efficiency of Abo Furad ore.
From these results, it is clear that lanthanides leaching efficiency increased from 44.3% to 57% when temperature increased from 50°C to 110°C respectively. In general, increasing the temperature enhances the solubility of the undesirable impurities such as: sulphides, arsenide, silicates, chlorides, clays and phosphates uranium [26,27]. However, leaching step can be conducted at 90°C where it gives the best result while, that at 110°C resulted in a slight increase in the lanthanide elements leaching efficiency. The experiment was made under the condenser to keep water. The effect of leach ore to acid ratio (S/L) from 1/1 to 1/5 (gm/ml) was studied under the following conditions: (-60) mesh size, 40 g/l of HCl acid concentration, contact time 8 hours and at 90°C. The obtained results data are graphically represented in Figure 6. Results of this factor revealed that 1/5 solid/liquid ratio gives the highest lanthanides leaching efficiency (98.5%). Figure 6: Effect of the solid to liquid ratio effect on lanthanides leaching efficiency from Abu Furad ore.
Lanthanides pregnant solution was prepared by applying the obtained optimum leaching conditions for the preparation of the pregnant solution. These conditions are: leaching agent HCl acid, 40 g/l acid concentration, 8 hours contact time, 90°C temperature and 1:5 (g/ml) solid / liquid ratio giving 98.5 % lanthanides leaching efficiency. To perform this step, the pregnant solution of Abu Furad radioactive pegmatite was subjected to two methods* of precipitation the first one was achieved by taking about 200 ml of the stock solution and 10% oxalic acid drop by drop with stirring till turbidity started. After complete precipitation and filtration the produced lanthanides oxalate cake was subjected to calcination process at 850°C for 2 hours. * The calcinated cake was identified qualitatively using the Scanning Electron Microscope model (EDX-SEM), PHILIPS. The obtained analysis chart revealed the presence of lanthanides (La, Pr, Nd, Sm, Gd), uranium and thorium in the lanthanides oxalate Figure 7. 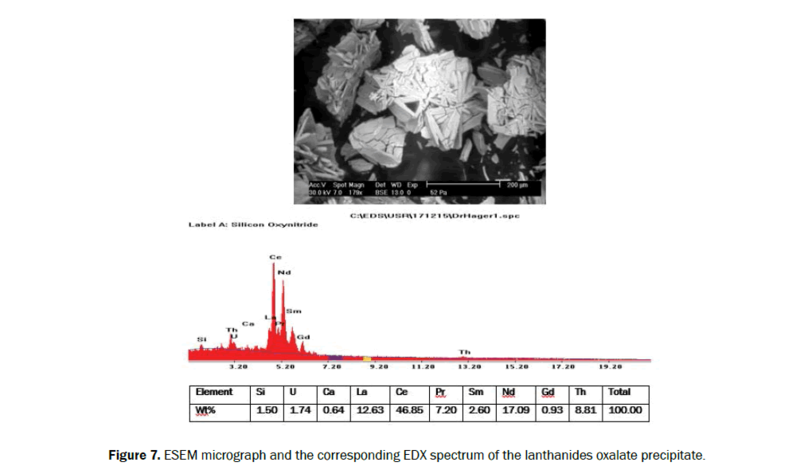 Figure 7: ESEM micrograph and the corresponding EDX spectrum of the lanthanides oxalate precipitate. Another stage of precipitation took place when the filtrate of the above step was left overnight and after filtration the produced precipitate which is the rest of lanthanides was also analyzed by the ESM microscope (Figure 8). Resulted chart revealed that the prepared stock solution reflected nearly high percentage of lanthanides leaching efficiency. Results obtained show that thorium found (10.05%) and light lanthanide elements with a high percentage are also recorded where, La (11.16%), cerium (39.97%), Pr (6.21%), Nd (13.99%), Sm (2.00%), and Gd (1.06%). 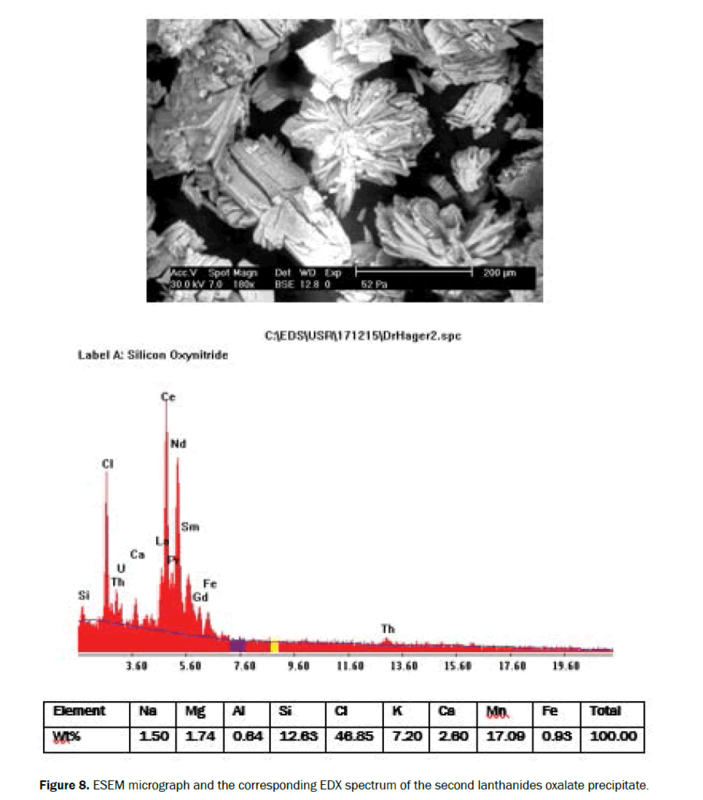 Figure 8: ESEM micrograph and the corresponding EDX spectrum of the second lanthanides oxalate precipitate. The second method of precipitation involves several steps. The first step is the iron precipitation step where iron was completely removed from the stock solution by adjusting the pH between 3.5 and 4.5 using 20 % NaOH Figure 9. After precipitation, iron hydroxide was removed and the filterate is tested for complete precipitation using potasium ferrocyanide test. If more iron still exsit, more NaOH was added, but if no iron exsited, the filtrate was subjected to the second step. When uanium is precipitated from the pregnant solution by adjusting the pH at 7 using 20% NaOH. Afte precipitation, uranium hydroxide is removed and the filterate is tested for complete precipitation using potasium ferro cyanide. If more uranium is still exsit, more NaOH is added, if no uranim exsits, the filtrate is subjected to the third step. When lanthanides is precipitated from the pergnant solution by adjusting the pH between 8.5 and 9.5 using 20 % NaOH. After precipitation, lanthanide hydroxide is removed and the filterate is tested for complete precipitation using potasium ferro cyanide. If more lanthandes was exsit, more NaOH was added, but if no lanthanides exsited, this means that a complete precipitation for lanthanide elements was performed. A technical flowsheet was designed and proposed for summing up all the steps studied for the recovery of lanthanides from the radioactive pegmatite sample Figure 10. Figure 10: Atechnical flowsheet for lanthanides recovery from the radioactive pegmatite of Abu Furad. Pegmatites of Abu Furad occur as pockets and vein-like bodies and show wide variation in both length and thickness. Lanthanides recorded in these pegmatites attracted attention to perform a hydrometallurgical study. The obtained optimum leaching conditions were: leaching agent HCl acid, 40 g/l acid concentration, 8 hours contact time, 90°C temperature and 1/5(gm/ml) solid/liquid ratio. Lanthanides pregnant solution was subjected to two methods of precipitation the first one was achieved by adding 10% oxalic acid drop by drop with stirring till turbidity started. After complete precipitation and filtration the produced lanthanides oxalate cake was subjected to calcination process at 850°C for 2 hours. Lanthanides cake was also analyzed by the ESM microscope where the resulted chart revealed that thorium found (10.05%) and light lanthanide elements with a high percentage were also recorded where La (11.16%), cerium (39.97%), Pr (6.21%), Nd (13.99%), Sm (2.00%), and Gd (1.06%). The second method was achieved by adding 20% NaOH at pH 8.5 to 9.5, after precipitation and filtration the obtained precipitate was calcined and analyzed by ESM. The resulted chart showed that no sign of lanthanides which reflected almost complete precipitation. European Union. Report on Critical Raw Materials for EU, 2014. Jorjani E, et al. Rare earth elements leaching from Chadormalu apatite concentrate: laboratory studies and regression predictions. Korean J Chem Eng. 2011;28:557-562. Tunsu C, et al. Reclaiming rare earth elements from end-of-life products: a review of the perspectives for urban mining using hydrometallurgical unit operations. Hydrometallurgy 2015;156:239-258. Lagowski JJ. Chemistry foundation and applications. Thomson Gile, Macmillan, USA;2009. Olanipekun E. Kinetics of dissolution of phosphorite in acid mixtures. Bull Chem Soc Ethiop. 1999;13:63-70. Alonso E, et al. Evaluating rare earth element availability: a case with revolutionary demand from clean technologies. Environ Sci Technol. 2012;46:3406-3414. Krishnamurthy, Gupta CK. Extractive metallurgy of rare earths. CRC press;2004. Golve A, et al. Rare earths supply chains: current status, constraints and opportunities. Resour Policy. 2014;41:52-59. Critical Materials Strategy, Department of Energy, USA;2011. Binnemans K, et al. Recycling of rare earths: a critical review. J Clean Prod. 2013;51:1-22. Tan Q, et al. Rare earth elements recovery from waste fluorescent lamp: a review. Crit Rev Environ Sci Technol. 2014;900240. Yang X, et al. Rare earth element recycling from waste nickel–metal hydride batteries. J Hazard Mater. 2014;279:384-388. Girgin I, Gunduz M. Recovery of rare-earths from bastnaesite flotation preconcentrate with hydrochloric acid, changing scopes in mineral processing. Proceedings of the 6th International Mineral Processing Symposium, Rotterdam, Netherlands; 1996;519-523. Green GK, Harbuck DD. 1996. Ghosh A, Ray HS. Hydrometallurgy: Principles of Metallurgy. Second ed. New Age International (P) Ltd., New Delhi, India;1991:270-279. Hudson TL, et al. Concentrating metals, Metal Mining and the Environment. American Geological Institute. Environmental awareness Series. 1999;3:28-35. Fulford GD, et al. Recovery of Rare Earth Elements from Bayer Process Red Mud. 1991;United States Patent, Patent number- 5030424. Cotton JA. Lanthanides and Actinides Chemistry. 2nd Eds, Wiley Textbook Series, USA; 2006. Ismail EM, Moharem AF. Fluid inclusion studies of radioactive pegmatites at G. Abu Furad area, Central Eastern Desert, Egypt. JKAU: Earth Sci. 2009;22:1-13. El Galy MM. Mineralogical, geochemical and radiometric characteristics of the granitoid rocks and associated pegmatites at Gebel Abu Furad area, Central Eastern Desert, Egypt. 5th International Conference on the Geology of the Arab World, Cairo University, Egypt; 2000. Kamal HK. Extraction of Uranium from the Radioactive Pegmatite Recorded at Central Eastern Desert, Egypt. IOSR J Appl Chem. 2016;9:40-48. Marczenko Z. Spectrophotomertic Determination of Elements. John Wiley & Sons, New York, USA;1936. Merritt RC. The Extractive Metallurgy of Uranium. Golden Colorado School of Mines Research Institute, Golden, Colorado, USA;1971.